Jack McMillen is famous for his (plunger) card rise. Seventy-five years after first appearing in print, it remains the preferred pure sleight of hand method for the rising cards, as well as a powerful more general concept that can be used as a force or a switch for example. 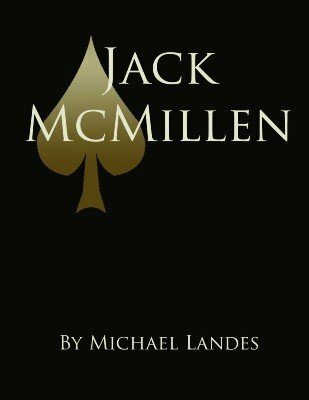 If you are an avid reader of card magic literature you will no doubt have encountered other effects credited to Jack McMillen – for example in Expert Card Technique , but his name tends to slip through and very little is known about him although he is without a doubt one of the great card men of all time. We have to thank Michael Landes who, starting more than 20 years ago on a suggestion by Paul Chosse, sat down with Jack McMillen and recorded his most important contributions to magic. Michael Landes meticulously and carefully studied every nuance and every detail to share with all of us Jack McMillen’s legacy. This is THE book on Jack McMillen. There will never be anything more authoritative on Jack than this book. The late Paul Chosse, another student of Jack McMillen, did not only suggest this book, but also generously offered to supply any material of his own that Jack and/or Mr. Landes thought appropriate. If you find any references to a ‘Jack McMillen book’ by Paul Chosse – this is it. This is the book he was referring to. Who was Jack McMillen? Jack was an all-rounder, a technician, creator and performer, and he excelled in all three realms. Blessed with prodigious skill, he was already one of the top card men in the country while still in high school (1925-1929). Due to his widening reputation, Charlie Miller, living on the other side of the country, sought him out in 1929. They were to remain close friends for sixty years. Blessed with a strong creative bent and an analytical mind, Jack was a superb problem solver, talented at refining the ideas of others as well as with coming up with original tricks and methods of his own. The measure of his talent lay not in the quantity of his ideas, but in their seminal quality. A startling number of his ideas continue to inspire new thinking even today. Blessed with an affable nature, gregarious personality and a fascination with the problem of making tricks entertaining, Jack evolved into a top performer. He really was truly charming, an ideal close-up magician. In spite of the miraculous impact of his tricks, the spectators primarily remembered him. Despite his status as one of the top card magician – friend and confident to legends like Charlie Miller and Dai Vernon - Jack never put a lot of his creations on paper. Other than the lecture notes he wrote for his Magic Castle lecture in the seventies and a single contribution to Charlie Miller’s Magicana, he never wrote up any of his material. The articles that appeared in print bearing his name were invariably written by others, with only minimal cooperation from Jack at best, and sometimes without even his knowledge or permission. As a result the descriptions usually missed salient details and were often downright inaccurate. This ebook will set the record straight. It will describe the most important contributions of Jack McMillen in minute detail. Mixed into the technical descriptions are some wonderful anecdotes and stories which will bring the person to life. One note of caution: This ebook does not have illustrations. We believe that the meticulous textual description allows for a more detailed and more accurate communication of method and their nuances than illustrations could provide. If you are the kind of person that quickly flies through a book glancing at a few illustrations to pick out what you think are the main nuggets of information, you will be disappointed. This is a book for the serious student of card magic. Take a deck of cards and follow along the descriptions of what you will find to be some of the most efficient and clever techniques with cards ever created. Paul Chosse: "Jack McMillen taught me to 'Go Slow! and be sure the audience understands the plot. Jack was the most unaffected, affable, charming guy you would ever meet. An old country preacher sort of a fellow, always a smile, soft-spoken, and gentle. He epitomized the card-handling techniques that Vernon espoused: he held the pack like a little bird, gently, softly. There were no hurried movements, no "big move covers the little move" actions. Just great timing, perfect excecution, and a pleasant personality and presentation that charmed people into submission! No one wanted to catch Jack - they wanted to be fooled! They like him and wanted him to succeed - that makes a huge difference. Jack's favorite text was Erdnase, though he studied all the classics. He was always trying to be better. Jack was never quite satisfied. Even his signature tricks, things he'd done for 50 years, could be altered if he found a better way. I remember him making a change in a trick he'd been doing since the forties, because Roger Klause showed him a little thing that fit, just right, in the trick. I don't even know that it made any difference to anyone else, but it made a difference to Jack, it brought the trick just an iota closer to perfection, so he used it. In fact, it was so small a thing that the first time Jack did the "new" version of this trick for me, I didn't notice the change. But like I say, Jack didn't do it for me, he did it for himself. He was an artist, a master, and he knew that this little change made his work a bit better, for him if not for anyone else. I learned a lot about magic from Jack, and a lot about human nature, and since his tools were cards I'd have to say he was the single most influential person in my card magic education. ......."
1st edition 2011; 263 pages.